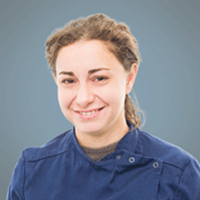 After qualifying from the University of Milan in 2004, Francesca worked in a number of small animal practices in Italy where she developed an interest in orthopaedics and neurology. For the last 6 years, she has worked as a neurology clinician in a specialist referral clinic in Rome. Francesca’s particular interests include epilepsy and minimally invasive intracranial surgery although she enjoys all aspects of neurology and neurosurgery. She is currently studying for the European Diploma in Veterinary Neurology, which she takes in October 2017. Magnetic resonance imaging findings in epileptic cats with a normal interictal neurological examination : 188 cases. / Raimondi, Francesca; Shihab, Nadia; Gutierrez-Quintana, Rodrigo; Smith, Alex; Trevail, Raquel; Sanchez-Masian, Daniel; Smith, Pete. In: Veterinary Record, 06.04.2017. Spontaneous Resorption of a Herniated Cervical Disc in a Dog Detected by Magnetic Resonance Imaging. F Raimondi et al. Can Vet J 58 (8), 855-858. 8 2017. Raimondi, Francesca, Palgrave, Christopher, Fraga-Manteiga, E, Witte, P and Shihab, N (2017) Infiltrative lipoma in a dog causing lysis and destruction of a thoracic vertebra without direct bony tumour infiltration. Australian Veterinary Practitioner, 47 (2). pp. 48-51.